About 3 months ago, I gave up Red Meat. That means I gave up Beef, Pork , Lamb, Oxtails..you get the picture. But there was one thing I couldn’t give up….BACON! I LOVE bacon!!! It is the best invention in food that ever was! Well that’s MY opinion. Now I have to give it up! Giving up red meat was the latest step in walking towards better health for myself. I gave up drinking coffee and I severely cut down my soda intake. I upped my fish and seafood and certain types of vegetables. I wanted to feel better. I wanted to look better. 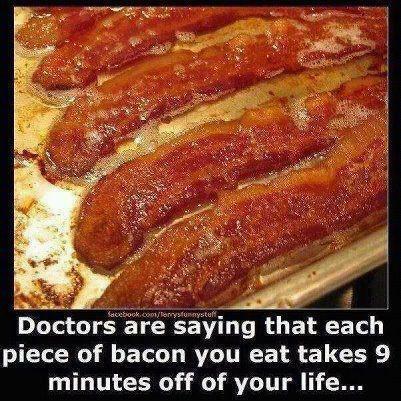 But Bacon was a hard one for me to stop eating. I am feeling better and looking healthier. I am okay without red meat. It wasn’t easy, but eventually my determination won out. The cravings have gone away. So NOW as I think about it, I can’t eat bacon anymore. It part of the pork family, which I gave up. I don’t feel good about eating it anymore. So I say thank you Bacon. Thank you for making everything you touch, taste better. I will always remember you and the good times we’e shared. Bacon, I will always love you.